Say the words “Tasmanian Devil” and for a lot of us, the edgy but lovable cartoon character “Taz” comes to mind. Hammy, a healthy Tasmanian Devil, has the face of a bear, the size of a small dog, and a bone-chilling screech. But the “real” devils, known for big teeth and loud screeches, are in grave danger of extinction from a deadly form of facial cancer. Scientists are trying to make sure the snarky cartoon character isn’t the only image future generations have of the icon of Tasmania. “It’s a very unusual mode of tumor transmission,” said Elizabeth Murchison, a native Tasmanian and molecular biologist at Cold Spring Harbor Laboratory (CSHL) in New York. A team of researchers at CSHL is studying Devil Face Tumor Disease, which was first identified in 1996. This cancer spreads when one infected animal scratches or bites another, passing on the deadly cells. The tumors grow aggressively on the face and neck; eventually they become so large the animal cannot eat and dies of starvation. On some parts of the island of Tasmania, south of Australia, more than 90% of the devil population has been wiped out. Murchison and her colleagues are sequencing the genes in the devils’ tumors, to better understand the genetic makeup of this rapid cancer growth. Australian veterinarian Hannah Bender, also working at Cold Spring Harbor Lab, is investigating why the cancer spreads so rapidly. “One theory is that the population is incredibly inbred, “ she said. That means the devil’s immune system doesn’t recognize the cancer cells as foreign, and does nothing to try to fight them off. “We have to look at this as a chance for modern molecular biology to help in an environmental catastrophe,” said Greg Hannon, Cold Spring Harbor Laboratory professor. So future generations won’t only know this noisy nocturnal marsupial from pictures in a textbook. The Tasmanian Government and the University of Tasmania are working to save the Tasmanian Devil. Find out more here. Click here to hear the bone-chilling screech of the Tasmanian devil. Its howl could also speak for more than 5000 endangered animal species worldwide. That's really sad. Action needs to be taken right now to stop these creatures becoming extinct. I had no idea that tumors could be spread like that – I'll be very interested when more research is done on this. There is a lot to be done if they're going to save these little guys. I was very privileged recently to compete in a 6 day (650km) adventure race in Tasmania which was raising money to help the Tassie devil, as well as for the Leukemia foundation. The race is an annual event created by Mark Webber (the Formula One driver), with an incredible bunch of volunteers and staff. If you want to check out the race and see the work their doing, this is the site. If you want to donate to the cause, go to this page to see the different foundations who are working to help the Tassie Devil. By the way, my team was lucky enough to see a baby Tassie devil on the trail while we were mountain biking. A real gift! 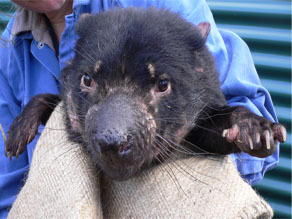 Here's the link to the various foundations helping the Tassie Devil. Just to clarify a geographic note in the article – Tasmania is not "south of Australia" but rather "south of mainland Australia." It's an Australian island state. I urge people to contribute to projects like this – it's really important for the future of our planet. Do you want to be part of the generation that goes down in history as making half of Earth's species of life extinct? Thought not. I hope they keep us posted on the research and hopefully, means to stop the progress of this before it's too late. As large a POPULATION OF UNAFFECTED ANIMALS as can be gathered should immediately be set in a quarantined area. If the rest of the unprotected animals die off ,then the tumor's genetic material when disappear with the last wild animal dies. This is kind of a heavy handed way to protect this species, but it sounds like it might be time for drastic measures, so the Tasmanian Devil doesn't become extinct. I agree with James. Quarantine to save the unaffected. Saving animals is good for the planet, good for humans and I believe is a moral imperative. Trying to save these animals is "unnatural" in the sense that this could be a case of humans preventing "Natural Selection" from wiping out a species that could not naturally adapt enough to survive. Are we people who are rational and see the world in a "scientific" way, or have we turned our back on science and people like Darwin, in that we are trying to maintain a static and unchanging world – one that matches or "idealized" view of the world? When we try to keep an "unfit for the conditions" species like the Tasmanian Devil from becoming extinct simply because it is "part of our identity", and when we try to preserve "natural" environments by trying to control "invasive" species, we are not recognizing the fact that environments change and the species that survive the changes, or thrive best under the changed conditions, while not necessarily the "best" or "cuddliest", are the species that the mythical "Mother Nature" has determined would survive. But then after all that... these things are just "sooooo cuuute!" I read your comment with much interest. So are you suggesting that we abandon building houses and generating electricity so that those of our species that die of exposure can comply with "mother natures" process of natural selection? If so then most likely the rest of her "children" could stop dying in droves from the unimaginable way that we, as a species, impact her "perfect" laboratory for natural selection. I must admit that I have no idea where you are or what you do for a living but I read the total lack of compassion in your comments as vaguely familliar in composition to the justification offered up in my country by greedy industrialists who fume and rail about someone with the audacity to suggest that they not make a profit in one way or other (either thru preservation of wilderness tracts or reduction of pollutants ejected into the atmosphere or water) to preserve some semblance of natures pristine (semi-pristine?) beauty. I hope you bear in mind that by your own presumptive analysis the human being would have been selected for extinction quite some time ago.